Eva Lesko Natiello is author of "The Memory Box," winner of the Houston Writers Guild 2014 Manuscript award. 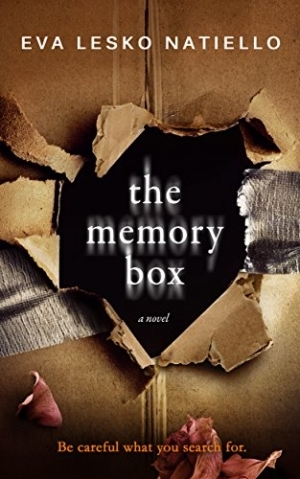 A psychological thriller, "The Memory Box" is the story of Caroline Thompson, a wife and mother whose life seems rather normal, until she discovers she seems to have memory loss. She searches her name on Google, a popular activity among the moms in her circle, and finds a past she has somehow forgotten. The more she learns, the more her world changes. Natiello takes the reader on a journey with so many twists and turns; I was continually surprised and did not expect the ending. I could not put this book down. I could not stop talking about it and recommending it to friends, so you can imagine how thrilled I was when Eva Lesko Natiello agreed to share her creative process with us. The impetus for "The Memory Box" came from an article in "The New York Times" about people Googling themselves. This was about ten years ago when people were just catching on to the idea of how regular-everyday-non-celebrity-people could see their names and anecdotal information in a very public way at the touch of their fingertips. This was quite extraordinary at the time. Almost like mini "15 minutes of fame." Early on, it became a power game of sorts. People would count the number of times their name appeared and used this as a basis of comparison and competition. This article mentioned that a 17-year-old boy who was living in Los Angeles, Googled himself and discovered he was on a missing persons list in Canada. He had no idea until he Googled himself, that he was a victim of parental abduction. The fact that someone could find out something so personal about himself from a Google search was a fascinating concept to me. What’s the most surprising or unexpected thing you learned about the creative process while writing it? One of the most surprising things I learned was that the characters tell you where the story should go. If you really know your characters well—and of course you should get to know them if you don’t!—they will direct the course of their fate within the story. I know this because when I started writing, before I knew Caroline very well, I had ideas for scenes that once written I realized were completely implausible. I remember saying to myself one day, after reading a scene, Caroline would never do such a thing. And I had to scrap the scene and start over. Speaking of process, how do you get inside your characters and their experiences, especially a character like Caroline? I have a bio for every character in the book, no matter their role. The more important characters have more extensive bios. They contain such things as, birthdates, physical descriptions (including scars—and where they’re from, appearance insecurities, etc.) personality quirks, pet peeves, childhood memories, strengths and weaknesses, fears and aspirations, favorite music, to name a few. For Caroline, it was important to see her childhood and her relationships with people, how she was treated or how she responded to disappointment and to victories—so that we get an idea of what might motivate her. She’s a complex person, and the person she was before the story begins is very important to understanding her, if that’s even ever possible. If you could meet three authors (living or not), who would you choose and why? Beatrix Potter, the author of Peter Rabbit. Not long ago I was lucky to visit her childhood home in England. It was there that I learned she was a self-published author. That was an incredible discovery for me. I was about to self-publish my first novel, so it was so inspiring to me to learn that such a successful female author from the late 1800’s had to muster the courage to self-publish without the benefit of social media! JD Salinger has been known to say that he never needed an audience of readers. He wrote only for himself, and he didn’t care if anyone ever read his work. It is so foreign to me, this viewpoint on storytelling. Wes Anderson, screenplay writer. It would be so much fun to have lunch with Wes Anderson, I imagine. Oh wait, did you say I’d have lunch? No. Well, this is my fantasy, right, which means it would always include food. I would be just so curious about how he thinks, what he talks about, what he’d order for lunch, what he’d wear. I’d imagine he’s one of those people who is sort of a natural born performance artist just being himself. I am working on spreading the news about "The Memory Box" and trying to get every book club in the world to read it. And I’m writing my second novel, also a psychological thriller. What’s the best writing advice you have been given? Get the story out of your head and on to the page. You can't edit something that’s not written. Please ask and answer one question you wished I’d asked. Apart from writing, was there anything else you had to accomplish to write the book? That’s a great question! One thing that surprises people is the fact that I made diagrams of the floor plan of Caroline’s house and road maps of the town of Farhaven. It’s really important that if a character runs down the hall toward the kitchen and passes the den on the right in Chapter 3, when she runs down the hall toward the kitchen in Chapter 9, the den better not be on the left! Most people don’t realize when they are reading they’re forming these visuals in their mind, so that in a later chapter they already know where the den is. If I’m not consistent, the reader will catch it!